Be the first to share your favorite memory, photo or story of Simeon. This memorial page is dedicated for family, friends and future generations to celebrate the life of their loved one. 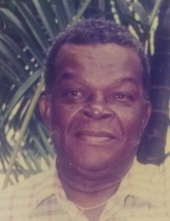 Simeon Morton, 91, of St. Thomas, died Monday, November 12, 2018, at his residence. Grandchildren: Selena Charles, Justina Henry, Jeanelle Lambertis, Latoya Harrigan, Torian Henry, Iriasha Atkins, Ira Morton Jr, Ika Morton, Damian Ottley, Shamika Ottley, Mavis Ottley, Julian Morton, Condilyn Jeffers, Chasie Morton, Chaston Johnson, Sa’Mandee Liburd, DeUmee Liburd. Nineteen (19) Great Grand Children. Sisters-In Law: Tavelyn Frazer, Bernice Bastian, Jermaine Glasgow, Patricia Isaac, Valarie Tywman, Dorothy Richardson. Nieces & Nephews: Ingrid Williams, Bernadine Warner, Winston Burt, Spencer Elliott – Other Nieces and Nephews too numerous to mention. Grandsons-In Law: Philip Charles, Ksharn Lambertis, Kevin Harrigan, Jeremey Kelso, Jason Atkins. Continuum (Hospice) Care: Our family wishes to thank the entire staff, especially Ava-lyn, Barbara, and Cassari, for your kindness and support. We are humbled by the care and compassion shown to us by all of you. Our mom’s passing and now our dad was one of love and peace, and we thank you for making this lasting memory of them one of dignity and grace. To plant a tree in memory of Simeon Morton, please visit our Tribute Store. "Email Address" would like to share the life celebration of Simeon Morton. Click on the "link" to go to share a favorite memory or leave a condolence message for the family.